In a previous installment we looked at the under-appreciated and underutilized leaden riches of the ANS cabinet. In truth, however, the lead coins are probably better known to many collectors and scholars than the Society’s holdings of terracotta and porcelain coins. Yes, that’s right. The same materials and processes used to make your floor tiles, your teacup, and your toilet have at various times been used to make money or monetiform objects. The oldest example—and my personal favorite—in the collection is a remarkable terracotta “elephant stater” of Seleucus I Nicator (312–281 BC) (Fig. 1). Figure 1. Silver “elephant stater” (tetradrachm) of Seleucus I from the Seleucia on the Tigris mint (second workshop). ANS 1944.100.44932. Seleucus began his career as one of the lesser commanders serving Alexander the Great during his conquest of the Persian Empire, but after Alexander’s death, he became satrap (governor) of Babylonia and then king in his own right over a vast territory stretching from western Asia Minor to the borders of India. 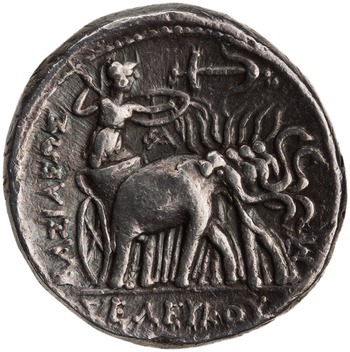 At his mints in Babylonia (and Susiana and Bactria) Seleucus I struck silver “elephant staters” featuring the head of Zeus on the obverse and Athena in a chariot drawn by elephants on the reverse (Fig. 2). Figure 2. Terracotta “coin model” of a silver “elephant stater” of Seleucus I. ANS 1944.100.44991. It is unclear what we should make of the Society’s terracotta specimen, which probably came from the Seleucia on the Tigris excavations carried out by the University of Michigan between 1927 and 1937. Terracotta coins of other Seleucid rulers have been published from these excavations, but the ANS piece appears to be the only “elephant stater.” The published examples are usually described as clay models used as references by die engravers in the Seleucid mint. However, all of the terracotta coins (including ours) look very much like they have been cast from moulds made from real coins that have seen some degree of circulation and exhibit some of their own surface wear, none of which we would expect from models for artists. One wonders whether the Seleucid terracotta coins served as tokens at Seleucia (they do not seem to be found anywhere else) in times of emergency, whether they might have served as some sort of accounting tool, or whether they had some other unguessed purpose. More modern and somewhat less mysterious, but certainly equally interesting are the porcelain and stoneware Notgeld (emergency money) coins produced in the German city of Meissen between 1921 and 1923. After the devastation of the First World War finally came to an end and a punishing Treaty of Versailles was imposed on Germany, the country sank into a nightmarish economic crisis that included shortages of circulating money. In order to make up the shortfall, the Royal-Polish and Electoral-Saxon Porcelain Factory (founded 1710) of Meissen produced porcelain and stoneware coins for German states, municipalities, and private businesses ranging in denomination from the pfennig to multiples of the mark and thaler (Fig. 3). Figure 3. Böttger ware 5-Mark Notgeld token of Altenburg, Thuringia, produced by the Meissen porcelain factory, 1921. ANS 0000.999.56653. In many German states Notgeld more commonly came in the form of paper notes rather than coins (Fig. 4). Figure 4. Paper 2-Mark Notgeld of Hannover-Münden, undated (c. 1921-1923). ANS 1966.88.6. It is a little ironic that the factory of Meissen was first to make money out of ceramics since the methods for producing white porcelain and a distinctive dark red stoneware (Böttger ware) were first discovered in Europe by the Berlin alchemist Johann Friedrich Böttger (1682–1719) while attempting to create the elusive Goldmachertinktur. This mysterious substance was supposed to give the alchemist the power to cure any disease and, perhaps more importantly, the power to turn lead into gold. Böttger’s efforts attracted the unwanted attentions of the frequently cash-strapped Frederick I of Prussia (1688–1713) and Augustus II of Poland, who was also the Elector of Saxony (1694–1733), and the alchemist frequently found himself held in “protective custody” just in case he was successful. The secret of porcelain was discovered in 1708, during one such period of “protection” by Augustus II. The King-Elector immediately recognized its implications and established the factory at Meissen. Prior to Böttger, porcelain could be obtained by the European elite only through the long-distance trade with China. As such it was valued like precious metals and was sometimes described as “white gold.” For a time in the seventeenth and eighteenth centuries porcelain was as valuable as money, but it only became money in a real sense in the early 1920s. Unfortunately, while porcelain and stoneware coins helped to fill in the holes in the circulating medium of postwar Germany and also held an attraction for collectors, their utility was hampered by their tendency to break easily. In the end, porcelain coins could not keep up with the hyperinflation that took hold of Germany in 1922–1923 (Fig. 5) and were abandoned as part of the circulating medium before the introduction of the new Rentenmark (a currency backed by land) ended the hyperinflationary period in November of 1923. Figure 5. Hyperinflationary paper 100,000,000-Mark Notgeld of Cologne, 1923. ANS 1993.35.709. A third notable group of ceramic coins in the ANS collection consists of porcelain gaming tokens that circulated as local money in Siam (modern Thailand) between 1760 and 1875. The colorfully-glazed white porcelain tokens (Fig. 6) were produced in China for use by the numerous private gambling houses in Siam. Figure 6. Porcelain gaming token from Siam (Thailand). ANS 1937.179.28443. It has been estimated that there were some 500 to 1,000 different firms, or hongs, that operated these houses and issued tokens. They were produced in a variety of denominations ranging from the att to the salung and involved many thousands of different designs as a means of preventing counterfeiting. Issues were also recalled frequently and replaced in order to thwart would-be counterfeiters. The system was evidently successful and the tokens seem to have inspired trust as money. However, the modernizing policies of the Siamese king Rama V (1868–1910), which included the introduction of a European-style royal coinage (Fig. 7), ultimately resulted in the prohibition of the circulation of the tokens. One is reminded of the much more recent use of casino chips as circulating money in Las Vegas before this was curtailed by changes to Nevada law in the 1980s. Figure 7. Bronze baht of Rama V (1868-1910) ANS 1940.160.245. In addition to the gold silver and copper coins usually associated with the ANS collection we should always remember the other, not so well known materials that make up the numismatic riches of the Society’s cabinet. Their stories are equally fascinating and worthy of being told. With each raising of the teacup and every flush it is good for numismatists to give a thought to the days of “white gold” and the remarkable places and people as well as the interesting (occasionally frightening) times that have given us porcelain coins.